Read "Return to Richardson, Spring 1981"
Of Your Passage, O Summer is a collection of poems from the late-1950s and early-1960s thought lost for decades, then recently found, and now published in honor of the poet’s 80th year. 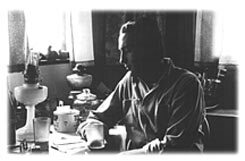 Haines, the poet laureate of Alaska, homesteaded in the wilderness 68 miles south of Fairbanks, working and living off the land. Written in relative isolation, they reflect news of the time—the Cuban missile crisis, confrontation with the Soviet Union, the threat of nuclear annihilation, the early stages of the Vietnam War. 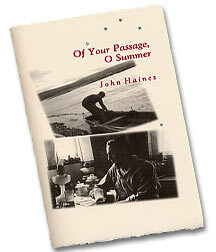 Of Your Passage, O Summer is letterpress printed on Mohawk Superfine paper, each copy sewn by hand into Rising Stonehenge wrappers in an edition of 500 copies. Fifty copies have been bound in cloth and boards and signed by the poet.